DESPAIR The railway tracks that end at the Gate of Death. 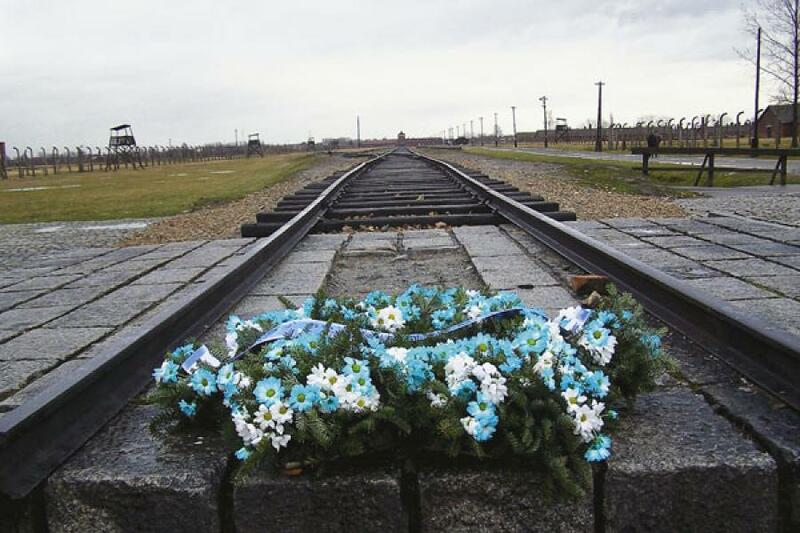 Trains ferried millions of people to the gas chambers in Birkenau (Auschwitz II). It’s drizzling. Raindrops fall on the camera lens, spoiling the photographs. Besides, the sky is white. Not the blue that makes a good backdrop for pictures. I have to clean my lens every time I click. I step into a large, darkish foyer. It’s crowded. A gang of college students is in a serious discussion. An anxious mother is running after two children. A small kid, dressed in a yellow jacket, is wailing. There are a couple of stalls, selling brochures, guidebooks and magazines. I join a long queue for the site guides, pay nearly 50 euros and get a bit of green paper that I am supposed to stick on my jacket. “Your guide will join you there,” a lady at the counter points to a spot outside a door. I go there. The trees sway to the wind. At a distance, there are rows of similar, sturdy, red brick buildings. The buildings look as if they are standing in attention, waiting for a giant to shout the next order. I close my eyes for a couple of seconds, and then look around. A 60-year-old chill creeps up my spine. The fences are electrified. There are watch towers. Three ominous words on a black iron gate say: Arbiet macht frei. Work makes you free. There is something about those words that evokes hope and fear at the same time. Work didn’t make most inhabitants free. Only death did. More than a million — Jews mostly, but also gypsies, homosexuals, Jehovah’s Witnesses, political prisoners — were systematically killed here, just an hour and a half from Krakow, where church bells chime. In the five years that Hitler’s most dreaded death camp was in operation, thousands of people were herded in, experimented upon, and exterminated. A few minutes ago, I was worried that the raindrops and white sky would spoil my photographs; I haven’t even stepped into the gate, and already I find that losing or gaining perspective is no longer in my control. I follow my guide to one hall after another: Cells converted to a permanent exhibition. On the walls, there are photographs of people who had just arrived at Auschwitz; men and women, young and old. Some of them look straight into the camera, as if they are in a photo studio before a happy occasion, eyes bright with hope, and a sweet smile on their lips. A girl in her 20s, beautiful, dark hair, looks confidently at me. The text below the photograph says she was killed a day later. These photographs were taken during the early days. Later, as the camp scaled up its operations, they stopped photographing people; cost-cutting. There are everyday objects: Plates, tumblers and utensils; bags and suitcases, shoes, a few with braces. And cans that once contained Zyclon B, the poison used in gas chambers. Auschwitz was the first to use it. Then there is the hair. From thousands of heads. The guide, in a halting Polish accent, tells us, “These were sent to German factories, to line jackets, bags and so on. Some of these you can still find in German homes.” The hair served another purpose. 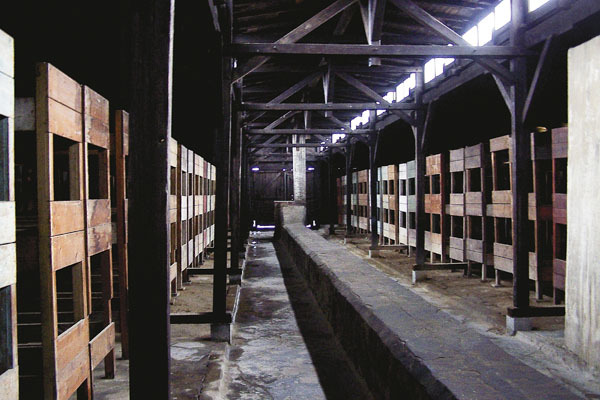 Labs later found traces of cyanide in them and this was used as evidence to prove that people were indeed killed here. But Auschwitz I doesn’t prepare me for Auschwitz II, three kilometres away at Birkenau. They say that part of the reason why the Taj Mahal makes such a grand impression is that to see it, you first go through a dark, narrow archway. Then you are suddenly face to face with something magnificent. Now, I know how it works. 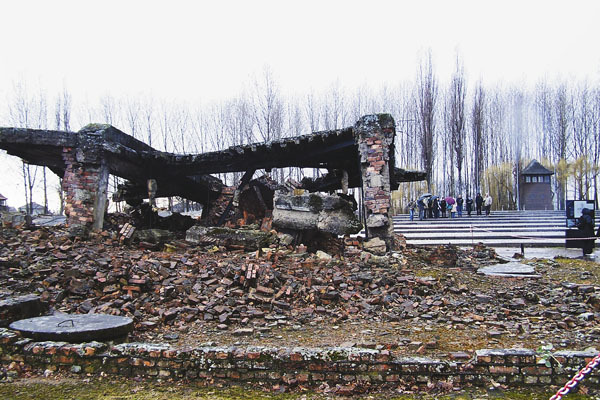 I enter Birkenau through a red brick building, and suddenly I am face to face with vast emptiness. A railway track guides me to some trees at the horizon. To my right and left there are sheds that seem to stretch on until the end of eternity. I feel small and powerless. Birkenau, Auschwitz II, is huge, about 200 hectare, 30 times bigger than Asuchwitz I, which was not designed to be a death camp. Birkenau was designed to kill. It was conceived, planned and built to be a death factory. You experience Auschwitz I with your head. You see the photographs, shoes, human hair, and you know the enormity. In Auschwitz II, your senses move down to the heart. Lower. You feel it in your viscera. The drizzle has now turned into a rain, with a hint of the darkness of yesteryears. For a week after I first watched Schindler’s List (which is not set in Auschwitz, except briefly), I walked around with scenes from the movie grabbing me from behind. Now, those scenes come back. The doctors, descending on the concentration camp for selection. Men with blank expressions strip naked and run around. It’s as if they were engulfed in an eternal darkness. I can smell the burning flesh. I know what I am seeing is a sanitised version. The two gas chambers at the far end — where the railway tracks stop — are rubble (destroyed by the Nazis as Soviet troops approached). 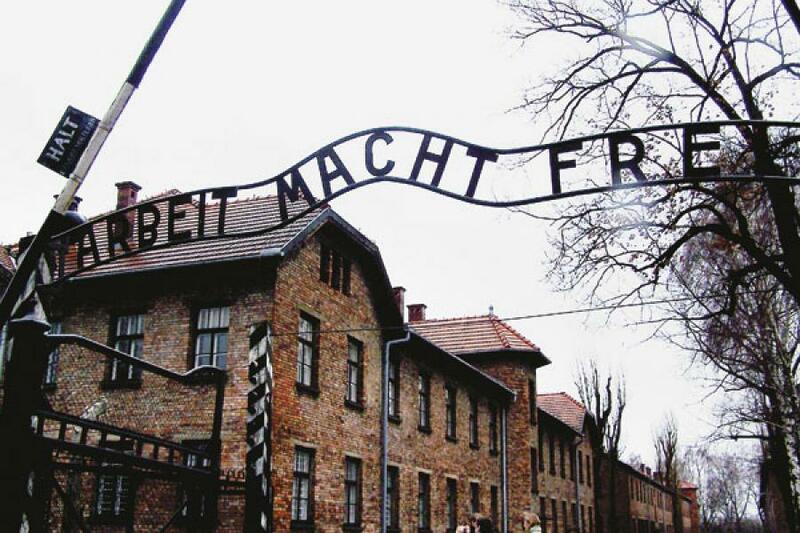 The other one in Auschwitz I needs a signboard to remind you to be silent and show respect to the dead. I am at the memorial, between the two gas chambers. Two women and a man are going around the grey, drab sculptures. I look towards the death gate at the other end, and try to imagine trains dropping off people. One of the women is sobbing now. Maybe she is crying for an ancestor, a relative or a friend. The other is trying to console her. I look at the building, the sheds, the railway track, the electrified fence, the watch towers and the rubble on either side. They give an impression of a huge system crushing down ordinary helpless people. The lady is still sobbing. Maybe, she is crying for all of us. Wonderfully written. I remember an Auschwitz victim being asked by an interviewer, \"how were you supposed to survive in here?\" She replied, \"you weren\'t\". Didnt know travel writing could also chill to the bone. Some day I must visit Auschwitz. Where death was made when it preferred to arrive to those in bulk. Among the mysterious ways of death is this one- where all who should die will somehow be gathered into place as the catastrophe is bound to happen. Everything is instilled death of the innocent and the cruelty of the killer. Some 5 years earlierTsunami that took southern Asian countries including southern India- death embraced millions of people- without judgement of the good and the bad. The cruel killer is the earth and it's resources. Death is the most terrifying, mysterious and yet the most intimate phenomenon of the human race. Only the primordial science of the Creative force and it's carriers through generations can answer this question - what is death actually? And the answer is available. facebook group and page: Art of Dying- The Primordial. All the swamis, gurujis, priests, philosophers, scientists have no definition nor the answer to this question and what happens beyond it. It evolves in a science of another world- the world after death. Only this science gives answers and proves the fact. Sorry don't know about then previous versions of the heaven and hell without scientific deductions and proof- but only the the answers that explain rationally with proofs and evidences.